here, the Holy Community of Gombin, May the Lord found it well! This Pinkas (ledger, register) was printed from a microfilm held in the archives of the Schechter Institute of Jewish Studies in New York. It was sent to them, together with other Pinkasim, for preservation at the beginning of the twentieth century, by Rabbi Yehuda Lajb Zlotnik known as "El Zet (L.Z. )", who later changed his name to "Avida". Then, after more than 100 years, it was printed from a microfilm by Noam Lupo from the Gombin Society in New York and was sent to me. and the story of its rescue by Rabbi Zlotnik in my research of the R' Zlotnik heritage, part of my family history personal quest. I discovered an article written by the Rabbi in Reshumot ("Records"), a collection of Memoirs, Ethnography and Folklore in Israel, published by "Dvir", Tel Aviv 1946, p. 217: "Remnants from the Community of Gombin". In 1911, Rabbi Zlotnik was nominated the Rabbi of Gombin, situated in the Mazowsza region, where he had a sister, my grandmother, Rasza Holcman née Zlotnik. This town was famous in the Jewish world because of its great Rabbi Abraham Abele Gombiner (1637-1683), son of Haim Levi, author of the important halachic book: "Magen Abraham". R' Zlotnik opens the article by describing the stories passed down from father to son about the great Rabbi, and his mother, a native of the town. One of the stories was that behind the synagogue and the Beth Midrash was a well which served many years ago as a "Mikve" for the purification of the daughters of Israel and in it, the mother of the Great Rabbi purified herself as well. Another story R' Zlotnik heard from one elder was that the Rabbi's mother used to come to the synagogue every morning, would sit in the women gallery and pray to G_d: "Gute-Morgen Got'ie" I cannot spend much time here, I have to go home and prepare food for my Abrehmele, so he will have power to deal with your holy Torah, "Gutten Tag Got'ie". R' Zlotnik was a folklorist, and he strived to record and preserve tradition, tombstones and lost Jewish culture which dominated Jewish life in Poland for many centuries. He writes in his article about the community Pinkasim (ledgers). One was about the Pinkas "D'Cheva Mishnayoth" (the Sociey for the Study of Mishnayot). He quoted a speech by R' Mosze Lichtensztajn found in the Pinkasim who founded the Society. The years it was active were around 1800-1880. The Pinkas included tax matters, names lists, synagogue kept seats, the erecting of more Beth Midrashim and schools, various payments and many events in the life of the Society. For example, it mentions that in the year of 1821, a new member was accepted into the Society: R' Dawid Tebeli, son of the famous genius Rabbi Szlomo, a rabbinical judge in London. 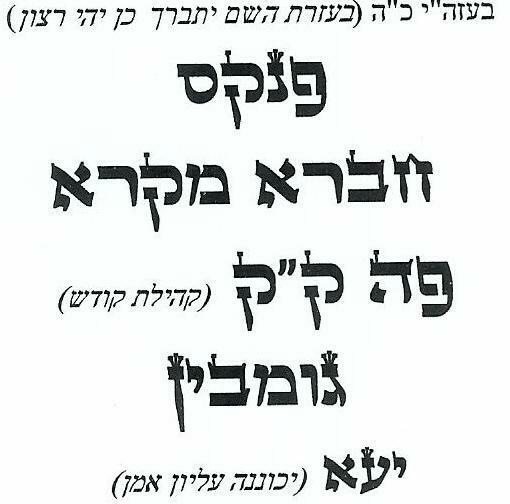 The second Pinkas R' Zlotnik write about in his article is the Pinkas of "Chevra Tehilim" the Society for reading the Book of Psalms. 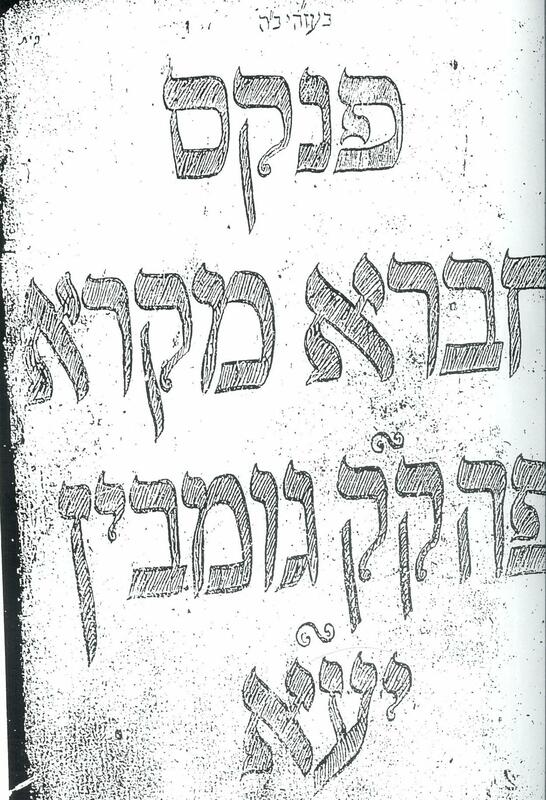 Also, this Pinkas opens with a speech by R' Mosze Lichtensztajn and the years are also in the same range, 1800-1880. 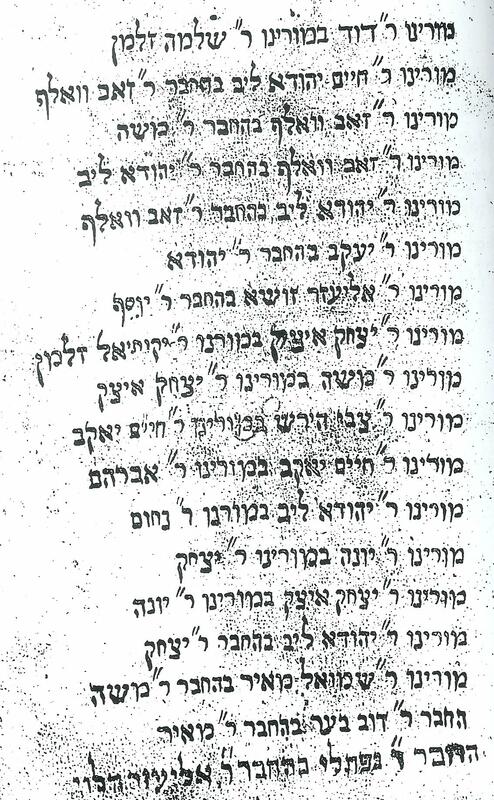 What was found in the Schechter Institute was a different Pinkas; although it is not mentioned in R' Zlotnik's article, it was one which he rescued and sent to the institute 100 years ago. This is Pinkas Chevra Mikra - The Society for Reading the Bible in Gombin. 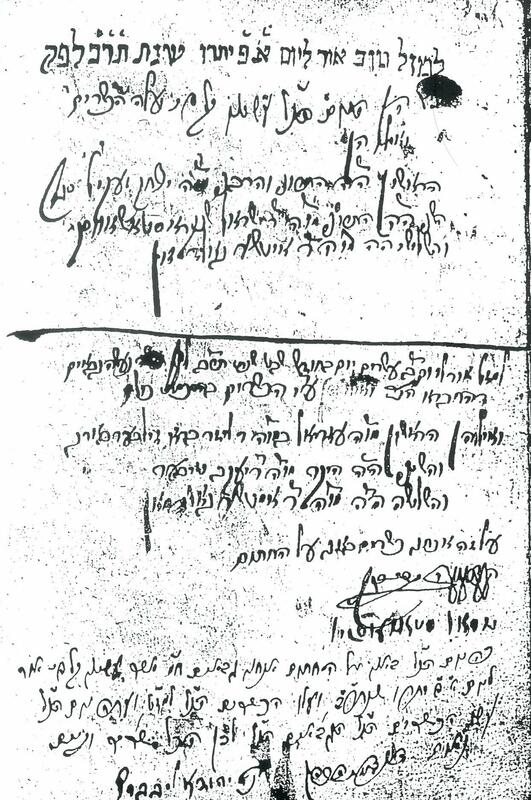 The Pinkas constitutes a rare document which revives the life of the shtetl, mainly its religious and orthodox way of life. Reading the Torah, its interpretations and meaning tied the Jews together, strengthened them and raised their spirits above the hardships of daily life. It was all written in Hebrew and it contains protocols, procedures, accounts, details of events, verdicts, rulings, prayers and more. I sensed that the members were totally dedicated to their roles and the Society filled their life with meaning and purpose. But there are many places where the surname already appears and so the Pinkas has also genealogical value. On page 140, I deciphered a summary of the election which took place in order to elect the men for the various roles in the Society and in the Synagogue. The handwriting is sometimes very difficult to read, in view of the time which has passed, the microfilm quality, and the text itself. The language is completely orthodox and religious, full of abbreviations, religious terms and sometimes in Yiddish. Noam Lupo, who should be commended for finding the microfilm in the Schechter Institute, may find his ancestors in the Pinkas: Lajzer Laks… Recently, one Miriam Goldstein from Farmington Hills searched in the Internet Gombin Forum for information about her Gombin family: Wisper. The name was changed during the years and the original name is Wispa. One of the names I deciphered in the Pinkas Mikra was Cwi Wispa, proof that someone with the name of Wispa lived in Gombin in the nineteenth century. This is the list I have managed to compile from the Pinkas. If anyone is interested in the original page, please let me know and I shall send the relevant page(s). In the article about the remnants from Gombin, R' Zlotnik recorded also 26 tombstones from the Gombin cemetery. He was concerned that the old cemetery and the great synagogue would be destroyed in the days of the First World War (which did happen, but one generation later, during the Second World War). So he photographed the tombstones and the 200-year-old great synagogue and sent them for preservation to his good friend Rabbi Lewin Epsztajn, founder of the famous Publishing House in Warsaw, which later moved to Jerusalem. R' Zlotnik writes that R' Lewin Epsztajn prepared from the photographs "glass mothers for pictures of light" – probably, he meant "negatives". I have written to the heirs of Levin-Epstein in Jerusalem, but no reply was ever received. 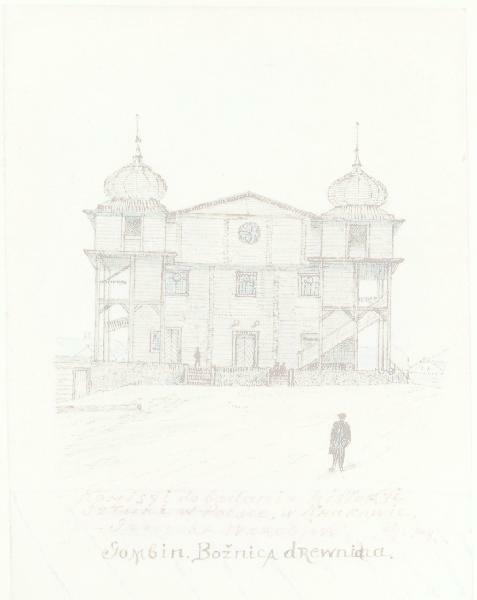 The photographs and negatives are probably lost and destroyed, as well as the great synagogue of Gombin and nearly the whole Jewish heritage of Poland, although it may be there as a miracle, and these treasures will be found eventually in a dusty archive or crumbling in a warehouse of one museum or another. In the article, he documented 26 tombstones, the names and the inscriptions. He commented that Gombin was a very Hassidic community and the tombstones prove it. They were ancient headstones from the eighteenth century, but beautifully written in figurative and traditional Hebrew. There are nearly no surnames, but one caught my eye which was an exception, tombstone nr. 17: "The divine philosopher, Rabbi R' Aharon Szlomo the Levite / ETINGER from the family of EITINEGA, natives of Mäharin (Moravia) the town of Holeŝov, died Kislev 1, 5644 (November 30th, 1883)". Since I knew the late Zelig Etinger from Kibbutz Evron all my life as a Gombiner married to a Gombiner (Rachel Kerber, blessed be her memory), I was astonished to find out that the roots of this family are not from Gombin, Poland, but rather Moravia… The wandering Jew ended up in a Kibbutz in Eretz-Israel… His brother Abraham Etinger z"l from Kibbutz Kfar Menachem wrote about "Hashomer Hatzair" in Gombin, in the Yiddish part of the Gombin Yizkor Book. The Etinger family of bakers was deeply rooted in Gombin, but their real roots were not there. Here is the data I extracted from R' Zlotnik's article, the chapter about Gombin Matzevot (tombstones). "A teacher and a judge here, the Holy Community of Gombin"
"The modest and important woman"; father was a Rabbi judge in Plock. The righteous, important woman; 53 years old; daughter of "one of the great men of Israel", grandson of the Tzadik Cwi Hirsz Malach, wife of R' Ziszel, Hassid.